Let’s back up and cover the Roth basics. Understanding these will allow you to calculate the basis you’re interested in, dear reader. 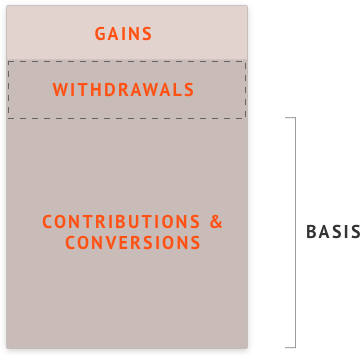 Roth IRAs have a perk allowing you to withdraw the contributions and conversions you’ve made at any time without penalty, but not the gains. The common scenario is you have a Roth account but you cannot withdraw the entire funds without penalty because you aren’t 59.5 years old yet, you haven’t had the account for five years or more, or one of the other withdrawal rules governing the account. 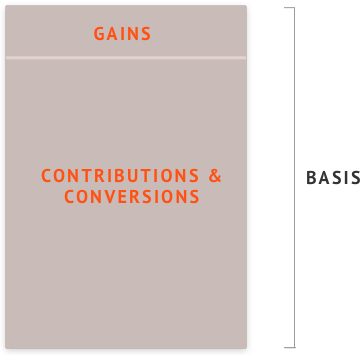 In this case, your basis is simply the total contributions or conversions you’ve made. This should be fairly simple to calculate since the gains in interest don’t matter. Just simply add up the total you’ve contributed to the account and ignore gains. For example, if you have a Roth IRA account with $12,000 and you contributed $10,000 to it ($2,000 is the sweet gains you made off interest), your tax basis is $10,000. It’s even easier to calculate when you do not have penalties when you withdraw — your basis here is the entire value of the account! This is because you have paid taxes already on your contributions and conversions (everything in the Roth is post-tax) and you are eligible to withdraw your gains tax-free. You are eligible without penalty if you are 59.5 years old and older and have had the account longer than five years. Let’s go through an example. Similar to above, if your Roth IRA account is $12,000 where $10,000 is from contributions and $2,000 is from gains but you are eligible to withdraw penalty free, your tax basis is $12,000. This is a more complicated scenario but it’s still possible to calculate the number on your own. Early qualified withdrawals do affect your tax basis. When you do this, your contributions and conversions are withdrawn first, which are nontaxable, and the gains on your fund are withdrawn last. Here, your tax basis will be your total contributions and conversions minus whatever you’ve already withdrawn. It’s common to convert accounts like a Traditional IRA or 401(k) to a Roth IRA. You may think this makes understanding your basis difficult but it’s fairly simple. Traditional IRAs, 401(k)’s, or other tax-deferred accounts are typically funded with pre-tax money. So your tax basis after converting these to a Roth IRA is $0 since none of your contributions have been taxed, right? If you remember, for Traditional IRAs, if you were at the time of contribution enrolled in an employer-sponsored retirement account like a 401(k), the IRS limits the amount you can deduct from your income. If you were still maxing our your Traditional IRA ($5,500 if under 50; $6,500 if over), you could have been putting nondeductible contributions in (read: your taxed money) into the account. This money collectively is your basis. This portion is important to know because when you withdraw — say when you are retired on a boat somewhere — you don’t want to pay tax on this sum of money (since you already did before putting it in). For example: you have a Traditional IRA account with a balance of $12,000, where $2,000 was made with non-deductible money since you were enrolled in your company’s 401(k). You converted this entire balance to a Roth IRA. The basis for the Roth IRA is $2,000. A friendly remember to always be careful when converting. In this example, you would need to pay tax on $10,000 ($12,000 - $2,000) since this amount was deducted from your income and Roth accounts only accept post-tax money. Let’s complicate things further. Say you are only partially converting a Traditional IRA to a Roth IRA. What is your cost basis for the Roth IRA? It’s simply the portion you had in the Traditional IRA. If you had a Traditional IRA with $100,000 and $12,000 was made with nondeductible funds, then your portion is $12,000 / $100,000 or 12%. You now want to convert only $50,000 of the $100,000 to a Roth IRA. Then your cost basis will be 12% * $50,000 or $6,000. A Backdoor Roth IRA is a method for high-income earners to get around the income limit to invest in a Roth IRA. 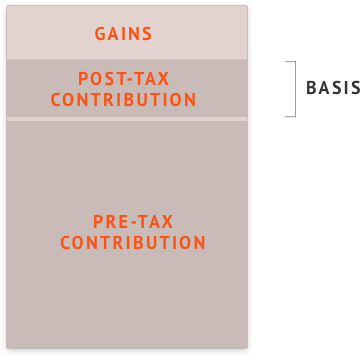 To calculate your basis when doing a Backdoor Roth IRA, you are funding a Traditional IRA, then converting — often as a full conversion — to the Roth. 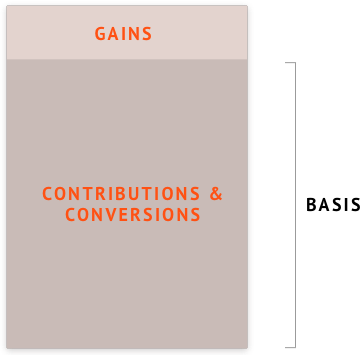 Follow the full conversion example above to arrive at your basis. A perk of a Roth IRA, unlike a 401(k) for example, is you are not required to withdraw when you hit a certain age. The 401(k) requires withdrawal at 70.5. This makes the Roth IRA attractive to give to your spouse or beneficiaries. If you have inherited a Roth IRA, the tax basis does carry over. It’s possible to find out what the tax basis is for the inherited Roth IRA by looking at Form 8606. So you were probably presented with the pesky Form 8606. We’ve covered some scenarios which might help you arrive at the numbers to include. If not, we encourage you to consult with a tax advisor (a few hundred dollar session can save you thousands).